The following pre-release review was conducted in May 2017 as part of Grandstream's Beta Club. The Grandstream DP720 wireless VoIP handset and Grandstream DP750 base station was used to conduct the review. The following review was conducted in March 2017 for the beta version of the Grandstream GDS3710. The GDS3710 is an IP video door system that also serves as a high-definition IP surveillance camera and IP intercom to offer facility access control and security monitoring. The GDS3710 also enables voice communication between the device and a chosen extension. The Grandstream GAC2500 is the company’s first conference phone. It follows in the path of the GXV3275 and GXV3240 as a touchscreen Android device. The smartphone-esque feel makes it sleeker than the conference phones we've become accustomed to, and the inclusion of this sort of interface means that the GAC2500 has already broken new ground, before we even start the review. The Grandstream GXP1628 is the most elaborate phone in Grandstream's new line of inexpensive SIP phones. The GXP1628 is shooting for the general use crowd with its respectable feature set and decent HD voice capabilities. 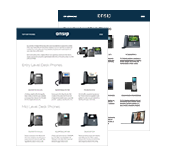 Imagine a stellar office phone that prices about $100 less than the Polycom Soundpoint IP 550 —that's what the GXP1628 is looking to offer.